I get the security and all - but I don't get how a blog is just deleted. This blog owner, like so many, does not understand how Blogger is trying to keep our blogs under our control - even after detection of "suspicious" / "unusual" activity. 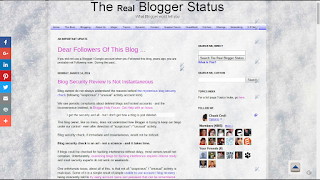 Blog security check, if immediate and instantaneous, would not be noticed. Blog security check is an art - not a science - and it takes time. If blogs could be checked for hacking interference without delay, most owners would not complain. Unfortunately, examining blogs for hacking interference requires intense study - and most security experts do not work on weekends. One unfortunate issue, about all of this, is that not all "suspicious" / "unusual" activity is malicious. Some of it is a simple result of people unable to use account / blog recovery - being innocently told to try every account name and password that can be remembered. Owner delay, in requesting account unlock, contributes to security check delay. In some cases, the locked account / deleted blogs may not be immediately discovered by the owner - and this may lengthen the security check process. Not all blog owners publish - or even read - their blogs regularly. Nor do they accept the need to intentionally keep their account and blogs under their control. 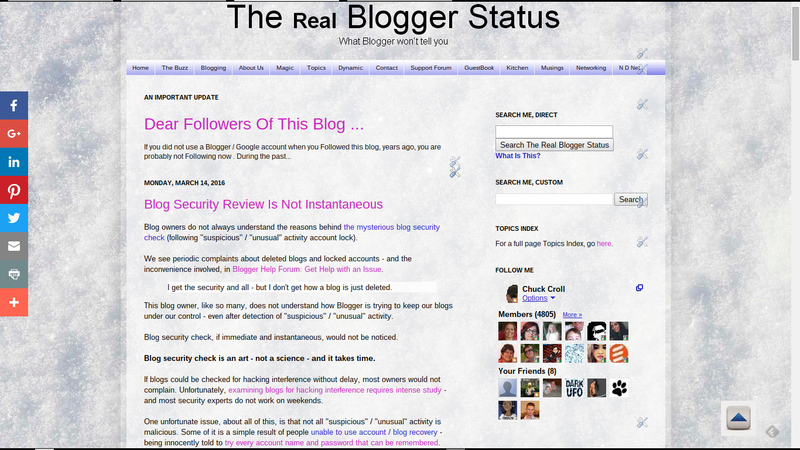 Some owners are very casual about blog security - until a blog is successfully stolen. Some #Blogger blog owners are not terribly impressed by the need to keep their blogs under their control, until a blog is stolen. The measures taken by Blogger / Google Security staff are considered mere annoyances.